Later today the 2019 National Baseball Hall of Fame class will be announced. MLB Network will carry the announcement live at 6pm ET. Spoiler: Mariano Rivera is getting in. Will Mike Mussina? We’ll find out soon enough. Here is the public Hall of Fame ballot tracker and here are some notes to check out. As mentioned by Matt over the weekend, Clint Frazier has been cleared for Spring Training following last year’s battle with a concussion and post-concussion migraines, he announced on Twitter. Pretty great news. 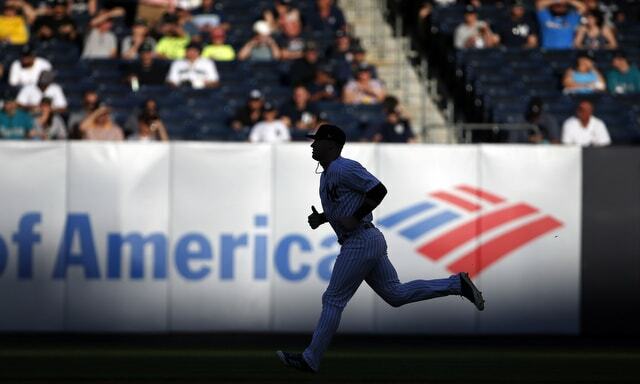 A few weeks ago Brian Cashman said Frazier was expected to be cleared for on-field work before camp opened and that is exactly what happened. Clint has been hitting off a tee and playing catch for a few weeks now. Now he can take everything a step forward. Frazier, 24, hit .311/.389/.574 (170 wRC+) with ten homers in 48 Triple-A games last season. He went 9-for-34 (.265) with three doubles in four separate MLB stints. My guess is the Yankees will have him start the season back in Triple-A to get regular at-bats for at least a few weeks. There is an open bench spot though, and it wouldn’t take much for Frazier to claim it. If he does, Clint could find himself starting in left field before long. I think the Yankees hope it happens by midseason. I can’t imagine being against a runner at second base to begin extra innings in Spring Training and the All-Star Game. Those games are meaningless. Heck, they usually call spring games a tie after nine innings anyway. Just don’t do it in regular season games. Also, I am against limiting defensive shifts. Let teams be creative. Besides, Travis Sawchik found that hitters are starting to adjust to the shift. Give them time to figure it out. As for the pitch clock, I am all for it. There is too much standing around between pitches. Fix that. At this point many MLB pitchers have used a pitch clock in Double-A and Triple-A, so it wouldn’t require that big of an adjustment. MLB proposed a pitch clock last year, so, even if the MLBPA rejects it again this year, commissioner Rob Manfred can implement it unilaterally. It’s unclear if he’ll do that though. Pace of play is not baseball’s biggest issue. Hardly. It can be improved though, so improve it. Those 16 early starts are all in April, May, and September. When the kids are in school, basically. Personally, I love the 6:35pm ET starts. It means less sitting around waiting for the game to start, and getting RAB work (recap, etc.) done earlier. I know I’m in the minority though. Getting to Yankee Stadium after work for a 7pm ET game is tough, especially with the security lines. Instead of missing the first inning, you might miss the first three innings with the early start times. Bummer.